Since entering UBC, Tim Krupa, a fourth year science student at UBC’s Okanagan campus, has embraced many facets of university life. He’s a physics teaching assistant, residence advisor, and President of the UBCO Young Liberals of Canada. He sits on the UBC Board of Governors. He’s a cancer volunteer and a talented athlete. And when he’s not judging science fairs or infusing kids with the love of learning, you may well find him on the phone mentoring high-risk youth. Considering Tim’s almost overwhelming list of academic and extracurricular achievements, it’s no surprise that he’s been the recipient of multiple UBC awards and scholarships. Most recently he received the Irving K. Barber School of Arts and Sciences International Education Travel Subsidy, which carried him to Africa on a unique project. When Tim returned to UBC Okanagan, he turned his focus to a directed studies research project, and was granted the Irving K. Barber Undergraduate Research Award which allowed him to return to Africa to assess the development and well being of the children he had worked with the previous year. 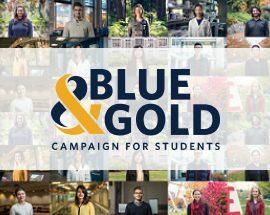 Additionally, UBC awards encouraged Tim to study in his hometown, allowing the Okanagan to retain an exceptionally gifted student and community leader.